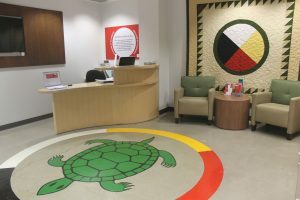 The Centre for Aboriginal Student Services recognizes that many Indigenous nations have longstanding relationships with the territories upon which York University campuses are located that precede the establishment of York University. York University acknowledges its presence on the traditional territory of many Indigenous Nations. The area known as Tkaronto has been care taken by the Anishinabek Nation, the Haudenosaunee Confederacy, the Huron-Wendat, and the Métis. It is now home to many Indigenous Peoples. We acknowledge the current treaty holders, the Mississaugas of the Credit First Nation. This territory is subject of the Dish With One Spoon Wampum Belt Covenant, an agreement to peaceably share and care for the Great Lakes region. Provide culturally-appropriate support services to the Aboriginal student population. Liaison, advocacy and referrals to on/off-campus resources. Liaison with First Nation Communities, Aboriginal agencies and organizations. Providing Information about educational assistance, funding procedures and guidelines. In keeping with its mandate, the Centre for Aboriginal Student Services (CASS) provides a range of workshops and support services for Aboriginal students. A primary purpose of these workshops and support services is to provide a space for Aboriginal students to explore, reclaim, and cultivate their histories and cultural identities. Consequently, registration is reserved for Aboriginal students at York. Community education sessions, open to all members of the York community, will be available from time to time. Contact the CASS office at 416-736-5571 for more information. Are you thinking of applying to study at York? We've created a special site for you - click here.